2, 4, 6, 8, who do we appreciate? 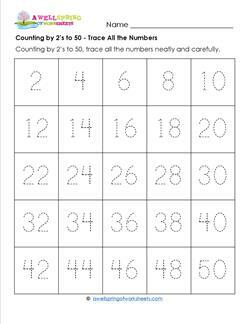 Skip counting by 2 worksheets! Hooray! Okay, enough of that! 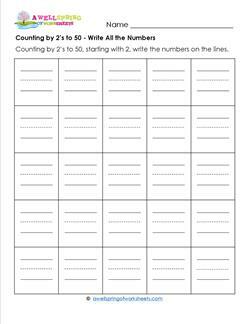 These skip counting by 2s to 50 worksheets give kids the opportunity to fill in the blanks, write on the primary writing lines, and trace the numbers. If you count by 2s in class, kids will be more aware of the count by 2 sequence and these will be easier for them. 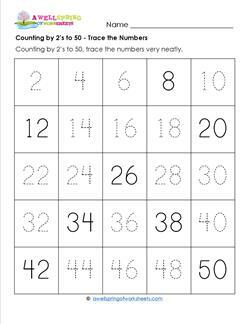 Work from tracing the numbers to filling in the blanks, saying the numbers as they are written. Kids like counting by 2's. 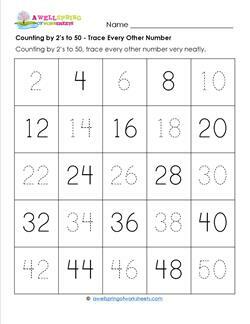 This worksheet makes the transition to writing by 2's a little easier by only tracing every other number. 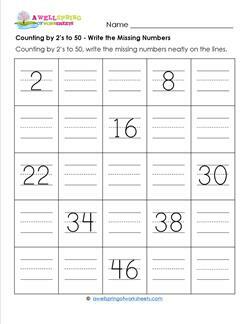 The purpose of this counting by 2's worksheet is for kids to get used to writing as well as counting by 2's. Some numbers are filled in to help them along. 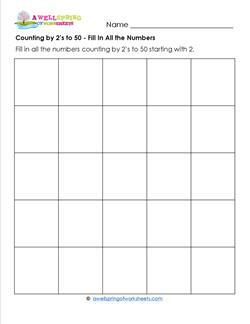 In this counting by 2's worksheet, kids get to trace all the numbers as they count by 2's. Counting and number tracing practice all wrapped up in one! 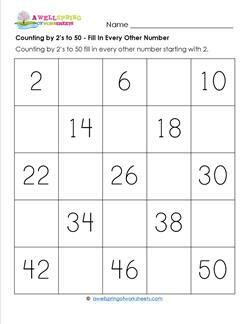 Before kids fill in this counting by 2's worksheet you may want to point out that the numbers in each column end in the same number (2, 4, 6, 8, 0). The numbers in this counting by 2's worksheet are left in place to guide kids along in the correct counting sequence, just in case they forget. This counting by 2's worksheet gives you the opportunity to have kids count by 2's while reinforcing writing their numbers in an orderly way - on the lines! 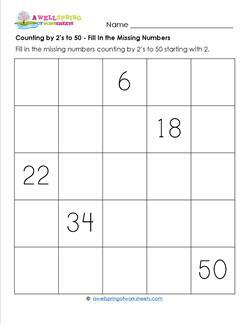 Have kids count by 2's, but as they do they need to stop and fill in every other missing number. I think they can do it! How about you? Oohh! This counting by 2's to 50 page has a few numbers filled in, one in each row. It's a confidence booster! Have your kids can fill in the rest. This counting by 2's to 50 worksheet is the biggest challenge of all - no numbers to trace, lines to write on, or numbers already filled in. Good luck!